This ancient lost Gospel from the Nag Hammadi collection found in the desert of Egypt is thought to have been written in the First Century. This is a letter from Jesus' disciple Peter, written to Philip, another disciple of Jesus. 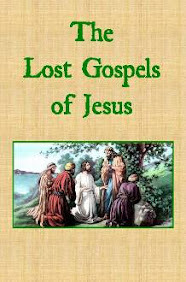 This lost Gospel discusses teachings of Jesus not mentioned in other Gospel texts. 1. Peter’s letter, which he sent to Philip: “Peter, the messenger of Jesus the Anointed of God [Messiah, Christ], to Philip, our beloved brother and fellow messenger and the brothers who are with you – greetings! 2. Please know, our brother, that we were instructed by our Master and Savior of the material world that we should go out and spread the teachings and preach the salvation promised to us by our Master Jesus the Anointed of God [Messiah, Christ]. 3. You, however, have been separated from us, and did not want to gather with us, and understand how we should organize ourselves so that we might preach the gospel. 5. When Philip received this, after reading it, he joyfully came to Peter, praising God. 6. Then Peter gathered the others as well. They traveled up to the mount of the olive trees – the place where they used to gather with the blessed Anointed of God [Messiah, Christ] when he was in the body. 8. “Creator – Creator – Creator of the light, Possessor of virtues, hear us, on behalf of Your being pleased with Your Holy Representative Jesus the Anointed [Messiah, Christ]. 12. Then a great light fell upon the mountain revealing his shining appearance. 17. “Master, we would like to understand what is the defect of this lifetime, and how is it corrected? 18. And how is it we became confined within this abode? 20. And how do we gain the power of courage? 23. “You yourselves are witnesses that I told you all these things. 24. “But due to your unbelief, I will tell you again. 26. “It occurred with the disobedience and foolishness of the mother, abandoning the instruction of the majesty of the Creator. She wanted to create eternal lifetimes. And when she spoke, the arrogant one followed. 27. “And when she left behind a portion, the arrogant one took it and it became a defect. This is the defect of this lifetime. 28. “When the arrogant one took a portion, he planted it. He assigned it with powers and authority. 29. “And he wrapped it within the mortal lifetimes. Then all the powers of the material world were glad they had been begotten. 30. “But they don’t know the eternal Creator who exists eternally, since they are foreign to Him. 31. “Instead they gave power to the [arrogant] one and they served him with praise. 32. “Yet the arrogant one grew proud due to the praise of the powers. 33. “He became envious and desired to create an image to replace the Image – and a form to replace the Form. 34. “So he commissioned the powers within his authority to mold mortal bodies. 35. “Thus they came into existence through a fabrication of the likeness. 36. “Next, regarding the completion: I am the one who was sent down to be in the body because of the generation that had fallen away. 37. “So I came down into their mortal mold. 38. “But they didn’t recognize me. They were thinking that I was a mortal man. 39. “Then I taught one who followed me, and he called on me just as all of you who called on me today. 40. “Then I gave him authority so that he might be able to enter into the inheritance of his Creator. 41. “Then I brought him, filled, and provided him salvation. 42. “Since he was defective, he became corrected. 43. “Regarding the nature of your being detained, it is because you are my followers. 44. “When you remove what is corrupt from your selves, you will become luminaries in the midst of mortal men. 45. “And this is why you fight against the authorities, because they don’t have peace like you have – and they don’t want you to be saved. 48. “For the chief priests are fighting against the person within. So you can fight against them in this manner. 49. “Gather together and preach to the world the salvation of devotion. 50. “Then you can gird yourselves with the power of my LORD. 51. “And put forth your prayers. Then He, the Creator, will rescue you. 52. “Just as He has rescued you by sending me. 54. Then lightning and thunder appeared from the sky. 55. And the appearance they had in that place was taken up to heaven. 56. Then the messengers made offerings to the LORD with many prayers. Then they returned to Jerusalem. 57. And while they traveled on the road back, they talked to each other about the light that appeared. 63. “I have told you many times – suffering is necessary for you. 64. “It is necessary for them to bring you to the synagogues and governors so that you will suffer. 68. Then they arrived at the Temple and preached the salvation on behalf of the Master Jesus, the Anointed of God [Messiah, Christ]. 69. And they healed many. 70. Then Peter began to speak and said to his disciples, “When our Master Jesus was in the body, he revealed everything to us. 71. “For he descended. My brothers, listen to what I am saying.” Then he was filled with the Holy Spirit. 72. He said this: “Our light, Jesus, came down and was crucified. 73. “He wore a wreath of thorns. And he put on a purple robe. 74. “Then he was crucified on a tree and he was buried in a tomb. 75. “And he rose from the dead body. My brothers, that pain is foreign to Jesus. 76. “But we are the ones who have suffered, through the transgression of the mother. 77. “And because of this, he did everything on account of us. 78. “As for the Master Jesus, the Representative of the unlimited glory of the Creator – he is the cause of our life. 80. Then Peter gathered together the others again. 82. Then Peter and the other messengers saw him, and they were filled with the Holy Spirit. 83. Then each one conducted healings. Then they parted ways to spread the teachings of the Master Jesus. 86. “And when you depart, you will have joy, grace and power. 88. The messengers parted ways and used the four teachings for the purpose of preaching. And they went with the power of Jesus, in peace.